I found exactly what I was seeking. Managed to work on two completely different games, met a ton of interesting and talented people. Some of which I could potentially work with in the future and expanded my understanding of going from an idea to a working game. It also helped me understand where I currently fit into the pipeline for when I decide to take on a gaming project. 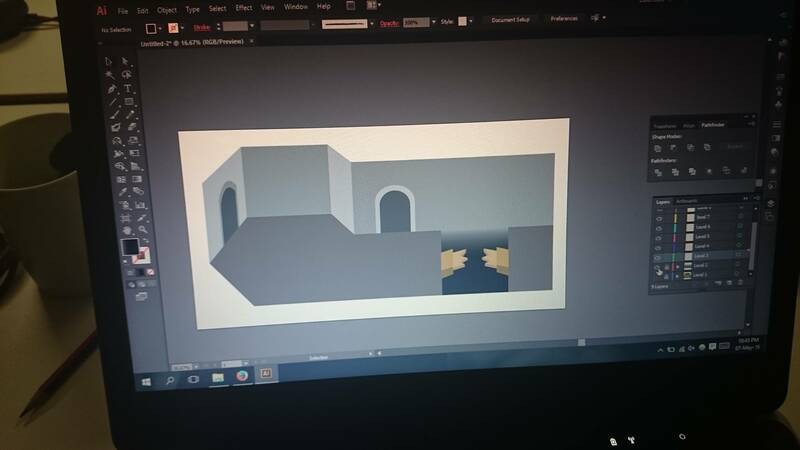 The first game that I worked on ended up being a 3D game were I had very little to offer the team, since all I knew was how to draw and use Illustrator and Photoshop. My hopes of making cool pixel art were shattered very quickly. So by noon of the second day, my work was done and so I decided to venture off and explore. A great decision, it turns out.. So as I’m chatting away to people working on their games and playing around with my own little prototype idea on GameMaker. By some mystical coincidence I stubble onto a two man team, LF1M (looking for one more). The one more being a environmental artist/level artist, which was a perfect fit. Anyway the game idea that these dudes were channelling was epic, both were super talented and chilled and they were taking on a monumental task. I was very quickly sold on the idea and committed to push my own limits and take on the challenge with them. So we were up and running with less than 24 hours to go. Teaming up with two game jam veterans really helped guide me through the process of achieving what seemed to me at the time, as impossible. Also a major factor in me achieving and surpassing my goals and expectations. Great progress was being made and things seemed more possible as we progressed and bounced ideas and thoughts off each other. Our developer, being super committed to the cause, stayed overnight to put the assets together and set up the levels, player and enemies. By the next morning things were underway and we picked up where we left off with only six hours to go. We were racing against the clock and my mind was sceptical of whether we could finish on time. Within an hour or so of the deadline my work was done, I was quite proud of myself. Not only for completing it, but doing it to a good standard (SPEED + QUALITY = PROFIT). But there was no time for me to bask in the glory of my own achievement. 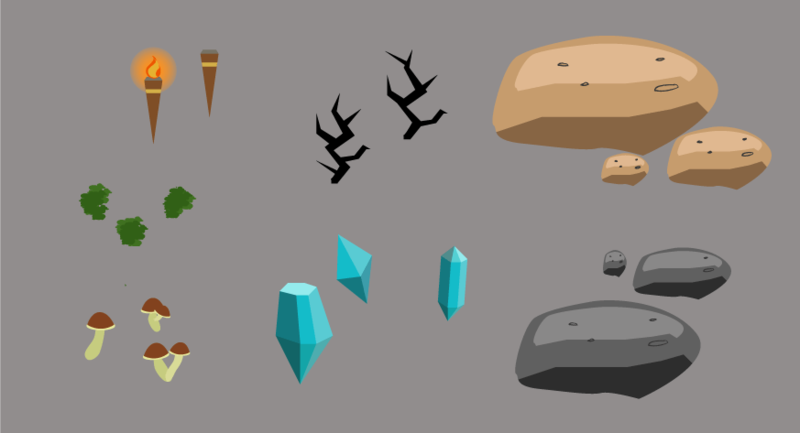 We had to hustle as there were additional assets that needed to be made and added onto the levels and game for greater detail and depth. So we worked hard while fighting off the waves of admiring game jammers curious to see what we were working on. Turns Out My Sceptical Mind Was Right..
We had over extended ourselves. We had a game, but it was buggy and needed way more polish to be presentable and have a chance of winning the competition. We were so short on time that much of the character & enemy sprites weren’t even used. And forget sound, our world was noiseless. But we had to compile it and click the submit button knowing we had worked our hardest and gave it our best. In the lands of Dunrow, there is myth of an ancient and rare Obelisk that favours the fortunate barer youth. Fortunate, because one must pass through an unforgiving and unknown dungeon, older than the nation itself. Our brave, yet old warrior seeks to unfold this myth. There was a sense of honour and comradery shared between us that day. Something rarely felt in my day to day life. We had all pushed our limits and even though our game wasn’t as fleshed out as we wanted it to be, we had a blast. The silver lining being that there was now a really cool game idea + assets which = potential for future development. So being 19th place wasn’t such a bad thing. I learnt a great deal and was able to work on an idea that I was really into with two really talented dudes. Oh and the first game came 1st, who would have known. Wait, does this mean I won my first game jam!? In hindsight, I’m not surprised the first game came first. When we teamed up, I knew we had a decent chance. Both of the guys seemed very switched on and knew what they were doing (game course students). Apart from that, even though the game idea wasn’t very exciting to me. It was a clever idea nonetheless. It was achievable enough that it left plenty of room for polish, which the guys did really well on. It would be safe to say that by some point in the second day they were essentially done. 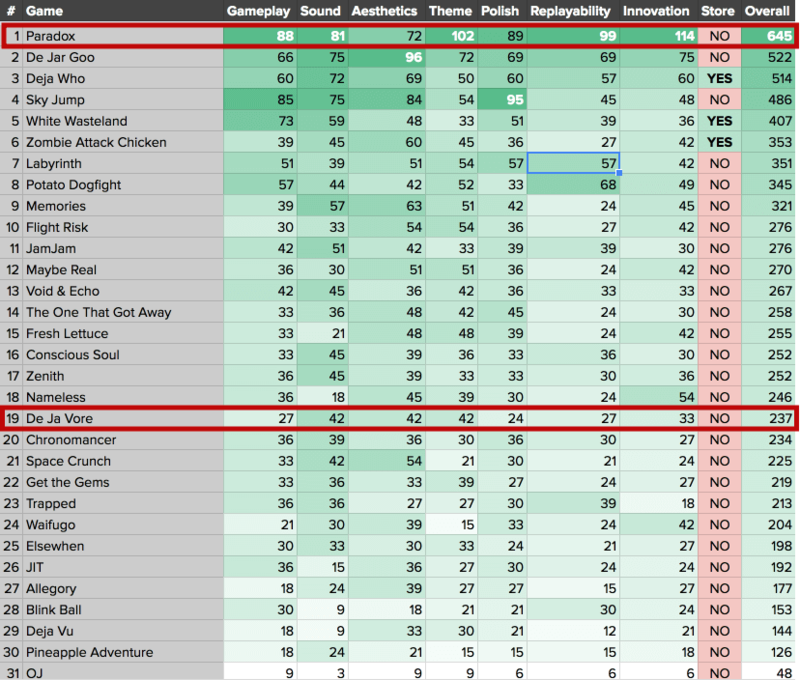 The games other strength was it’s replayability, a category that I did not think we were being marked on. All in all, even though I didn’t have a huge input in the game itself. I offered value to the group by using my networking skills and getting everyone together. Sometimes all you have to be is the glue in the middle. NOTE: I’ve recommend an Onnit product above, that I don’t personally use. My body doesn’t do well with Garlic and Ginger (ingredients). But! This business is the best when it comes to supplements and related products. The reviews speak for themselves and there is a 100% money back guarantee. No doubt you’ll a have positive experience with Onnit. Anyway, this is all I have to share with you on game jamming. Keep an eye out for updates and related content. Or sign-up for the mailing list to get it directly.